Please note that this post is most relevant to central MN. I imagine it could be useful to those living elsewhere in North America, but there are likely to be other look alikes. This past summer, I was asked about the difference between Stinging Nettle and Wood Nettle, good plants to be familiar with since both can cause a painful rash when touched. 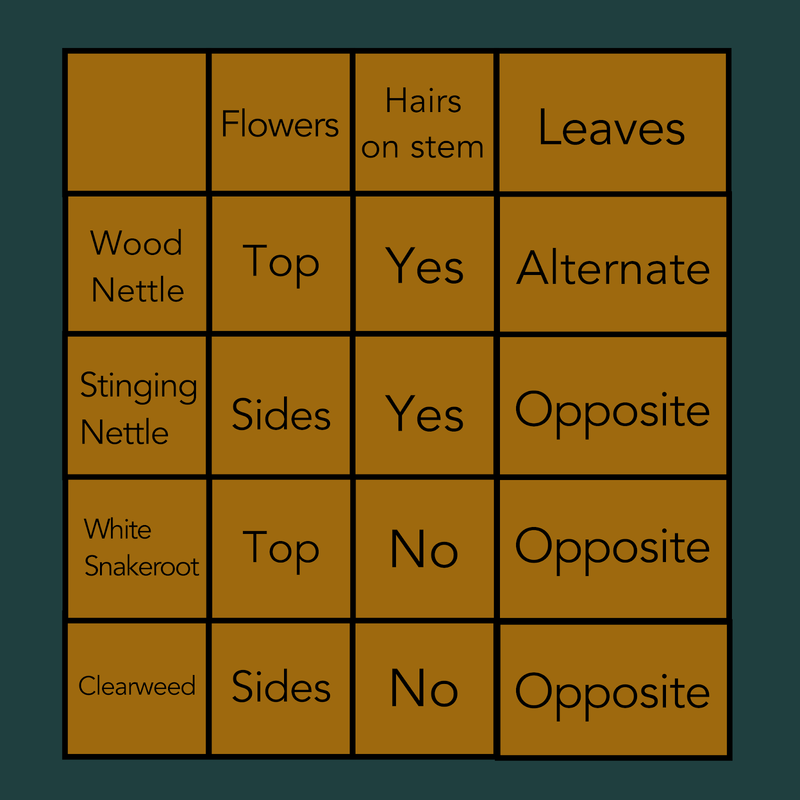 While pointing out the differences, a couple of other look a likes were discussed, Clearweed and White Snakeroot. Overall, they resemble one another; each shares a similar pointed oval leaf shape with toothed edges, and can be found in the same area (though habit preferences for each aren't necessarily the same). First, let's introduce the plants in question. Next, some comparisons of the four plants. By the way, I'm keeping my terminology purposefully non-technical. Some details might be missed, but I want to make the information accessible as possible; I imagine there are a lot of people who would like to be able to recognize Stinging Nettle. Flowers: Are they growing at the top of the plant, or along the sides of the stems. Wood Nettle and White Snakeroot have flowers at the top of the plant, Stinging Nettle and Clearweed have flowers along the sides. You could argue that White Snakeroot doesn't belong in this discussion because its flowers are clearly different (they actually look like flowers). But before the flowers have fully opened, White Snakeroot looks pretty "nettlish". Hairs on stem: Are there hairs on the stems or not. Stinging Nettle and Wood Nettle have hairs on their stem, and on their leaves; it's what causes the "sting". Clearweed and White Snakeroot do not have hairs on their stems. Clearweed has a very translucent appearing stem. Leaves: Are the leaves arranged opposite along the stem, or alternate? Wood Nettle is the only one that has alternate leaves. This is an excellent comparison! Unfortunately, my nettle-like plant with pink flowers isn't among yours. I keep seeing and smelling this non stinging, opposite leaves, and very smelly nettle-like plant here west of the Cascades. Can't figure it out. Sorry, I probably can't help. I'm not all that familiar with plants in that area. I'm confused My nettle like plant has tinywhite trumpet shaped flowers on long stems like your stinging nettle pick, they go along the sides of the plant. The leaves are opposite and look just like your stinging nettle leaves. The stem however looks like your Wood nettle stem softer fuzzier looking ...But the plant does not sting. Any clue what I got here? Charlene - could it be a Common Hemp-nettle (Galeopsis tetrahit) ? It could be Common Hemp-nettle. I've never noticed it, but it is apparently present in MN and becoming problematic in some parts of the country. Are any of these look a likes toxic? P.S I am writing a little book about wild edible greens that I am going to give for free on my website. Can I use a few of these pictures from this post, sourcing them to your site here? (I already added a link to your site, related to the information about white Snakeroot). Thank you! I found a plant in my garden. Leaves opposite of each other. White flowers on top. Hairs on stem, tops, and bottoms of leaves. Has a woody, almost sour smell. It does not sting when touched. Looks like a nettle of some type. I just can't figure out what it is. The leaf orientation (opposite vs. alternate) listed in your table is incorrect for every plant. 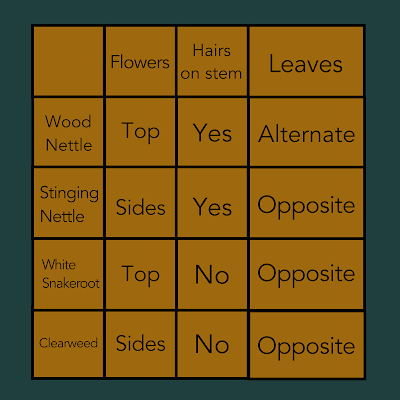 The correct orientation should be "alternate" for wood neetle only and "opposite" for stinging nettles, white snakeroot, and clearweed. Thanks for noticing the mistake. It's been fixed. The photo says, "Wood Nettle is the only one that has alternate leaves", while the chart says wood nettle has opposite leaves. Thanks for noticing the inconsistency. It's been fixed.